Born in Cape Town, South Africa, Jonathan began his career playing professionally for Cape Town-based team Vasco da Gama in 1999, and then for Mamelodi Sundowns in the South African Premier Soccer League from 2000 to 2003. He also represented South Africa internationally at the U-23 level from 2001 to 2003. 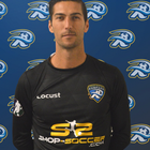 Jonathan moved to the United States in 2004, and for 8 years divided his time playing both outdoor and indoor soccer. On the outdoor front, he played in the USL First Division for the Milwaukee Wave United, Minnesota Thunder and Rochester Rhinos and in the NASL for the Carolina Railhawks and San Antonio Scorpions. On the indoor soccer side, he has played for the Detroit Ignition, Baltimore Blast, Milwaukee Wave and Cedar Rapids Rampage in the Major Arena Soccer League. Jonathan has been a member of multiple championship teams including the 2004 Milwaukee Wave, 2009 Baltimore Blast and the 2010 and 2011 Milwaukee Wave. Since moving to the United States, Jonathan has been involved in coaching youth soccer for club teams as well as coaching through the professional teams he played for. For the past three years, he held a coaching position with Waukesha SC. While there, he coached various age levels and took the U18 Boys to win the state championship in 2013 and to the national semi-finals in 2014. He enjoys giving back his knowledge of the game and watching youth players develop their soccer skills to become great players. Jonathan resides in Cedarburg, WI with his wife, Layne, son, Espen and Black Labrador, Murphy.